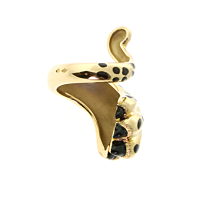 Made from gold and featuring a panther tail that winds seductively around your finger, the Dior Mitza Panther Ring is meant for those who continuously search for uniqueness in the jewelry world. The panther's paw encircles your finger protectively while the black tipped claws appear to relax gently against your skin. 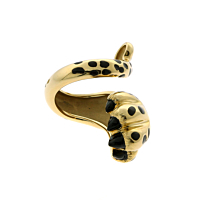 The ring's black panther-inspired spots make it easy to pair the jewelry item with everyday apparel or evening attire as well as with other wearable adornments like a classic gold necklace or diamond earrings.This show-stopping piece brings a touch of the wild to your outfit, and since its leopard print is a tribute to Christian Dior's muse, Mitzah Bricard, you may find yourself channeling her legendary elegance. Often, Dior's jewelry pieces mimic the movement of the great designer's clothing styles. You'll see this element represented in the leopard's tail as it coils toward your hand. With this Dior ring on your finger, you'll subtly show people your untamed side while owning a piece of jewelry that exudes quality.